Here we are at our next big renovation. We've called it our "corner cottage," Or if you're on Instagram, you can find posts under #ourcornercottagereno. We closed on this 2,000 square foot house (and the little 700ish square foot neighboring house) the second week of August. We completed all of the major renovations over the next three and half months. Most of that time we were living in a rental house. But here we go. I wanted to show you what the house looked like before and show you some of the in-progress pictures. The exterior of the house is super cute. The above pictures are from the MLS listing. It was quite overgrown and in need of some TLC, but I saw the potential. We don’t have any major plans for the exterior right now. I would love to re-side it and do several other things, but for the time being, we put on a new roof, took off the awnings,and removed and trimmed up some of the bushes and trees. I have dreams of window boxes and a picket fence…and landscaping...and gutters…. The living room is right inside the front door. When you walk in, the room naturally divides into two spaces. The area on the right has the fireplace and the area to the left is a smaller space that could be used as an office or a second seating area. 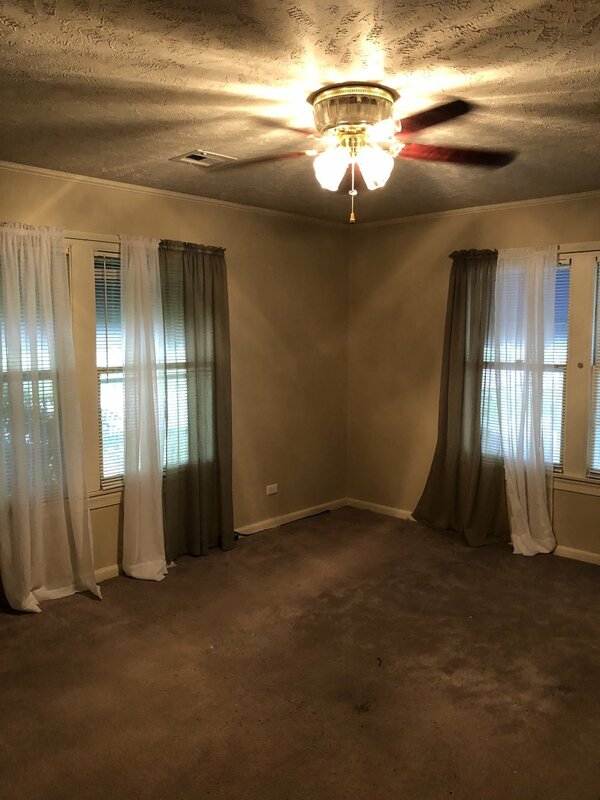 Thankfully, there were original hardwoods underneath all of the carpet and most of the faux wood flooring put down in the dining area. We decided to move (and make a little smaller) the doorway from the living room into the kitchen/dining room. This allowed more wall space in the living room and we could now put a full sofa and chairs around the fireplace. We also needed more wall space on the other side of that wall for the kitchen cabinets. Removing the awnings and window treatments allowed so much more sunlight in this room. The walls in several rooms of the house were heavily textured. We opted to do a skim coat in those room versus the more costly and time-consuming option of re-drywalling them. This next area is the dining and kitchen space. The previous owners had built an addition and had remodeled the kitchen at some point. I’m sure it was better than what was there previously, but the space was very broken up and there was lots of unusable space. It might be hard to follow the picture tour of this area, but just wait until I show you what it looks like without any of the walls! Above, you’ll see the same space with everything gutted out. The next step was to have several LVL beams put in so we could remove all of the supporting beams and make this room super open. So this new open space was going to be where the kitchen, dining, and a little sitting nook were going to be. The only windows in this whole space were along that one wall (which you’ll see in a bit where we ripped those old windows out and installed doors and floor length windows). Where the door is currently in the pictures above, we turned into a window because the kitchen cabinets were going along that wall. You can kind of see in the pictures where I have the kitchen cabinets mapped out with green tape. At this point, things started coming together pretty quickly. Kitchen cabinets arrived, everything was getting painted and floors were being refinished. We used WOCA Wood Care products on our floors and I absolutely LOVE how they turned out! I wanted the floors to have a raw, European look to them. I wanted them super light without any pink or yellow undertones, and I think they turned out wonderfully. The floors are white oak. We used the WOCA wood cleaner to prep the floors, then we used the Wood Lye White, and then the Diamond Oil Active White to finish them off. And when I say “we,” I mean the wood floor company we hired :). I love that WOCA products are natural and non-toxic! I found the customer service at WOCA to be very helpful with figuring out what products I needed to use based on the type of wood we had and the look I was wanting to achieve. This post is already getting to be quite long, so I will talk more about each room, the products we used, and sources etc. in another post. Now lets carry on with the “before and during” tour of the bedrooms. Above is the guest bedroom. Besides painting, refinishing the hardwoods and changing fixtures, we won’t do a lot in here. I still haven’t decided what I’m going to do to update the vanity. 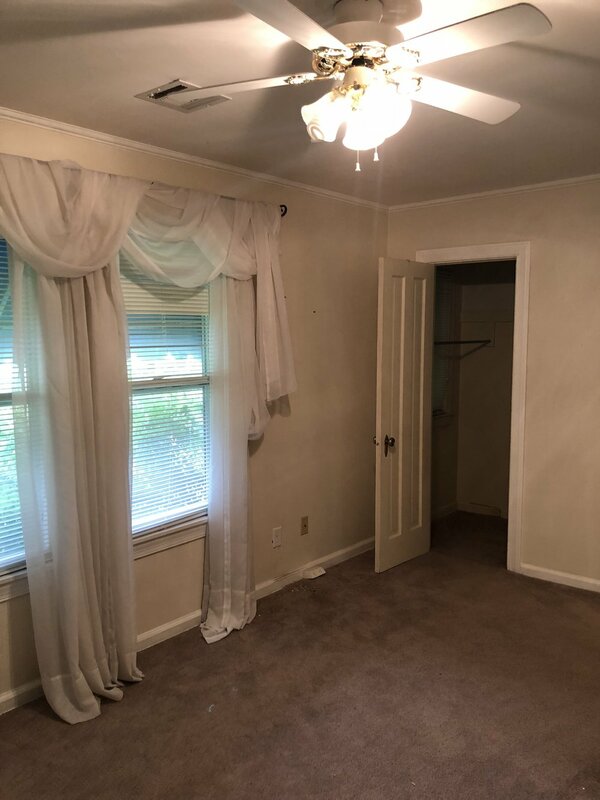 I love the built-ins, but they need some work. The second bedroom on this side of the house used to be the master. It’s a nice size and has a whole wall of built-ins in addition to the closet. The boys will eventually share this room. The hall bathroom needs a complete update. We demo’ed most of it but haven’t finished this room yet. 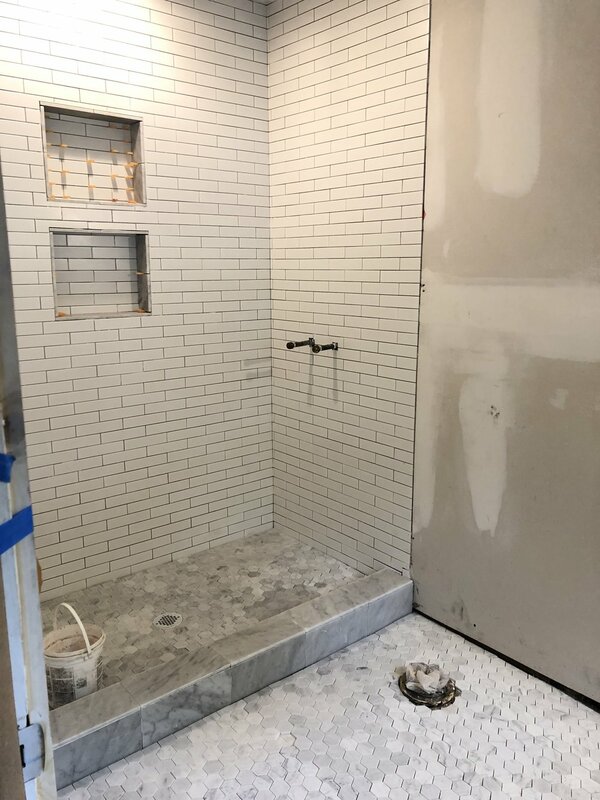 We focused on the master bathroom for now. Originally, we were just going to save both of the bathrooms to be completed later one-by-one. 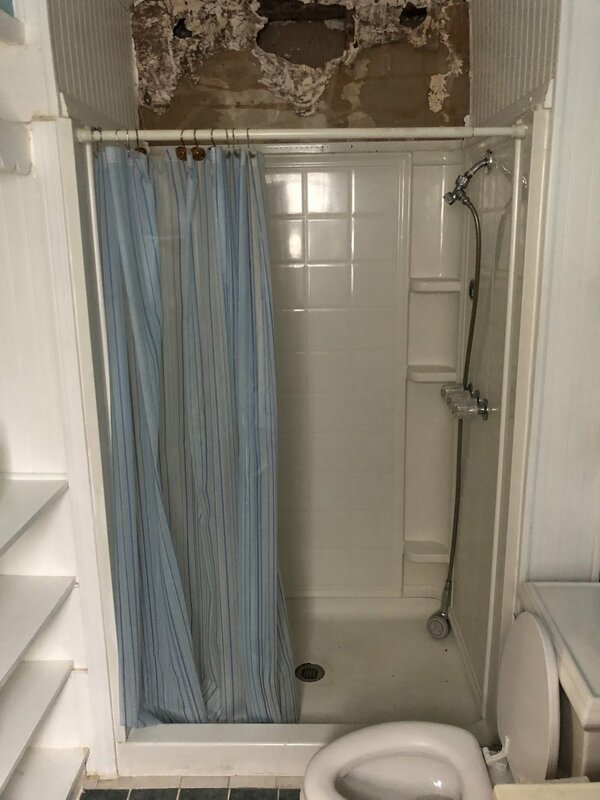 However, there was termite damage behind the master bathroom shower, so we went ahead and tackled that project. We’ve completely demolished and rebuilt three kitchens and three bathrooms during our marriage so far and I would take a kitchen remodel over a bathroom remodel any day of the week. They are such a nightmare! The master bedroom was another room that had crazy intense wall texture going on. So, we skim coated this room as well. New windows and trim went in. We’re big fans of simple, 1x trim in our houses. There weren’t any original hardwoods underneath the carpet in this room since it was an addition, so we had new white oak floors put in. I didn’t take many “during” pictures of the bathroom, but here are a couple I snapped. We just opted for a shower (no tub). 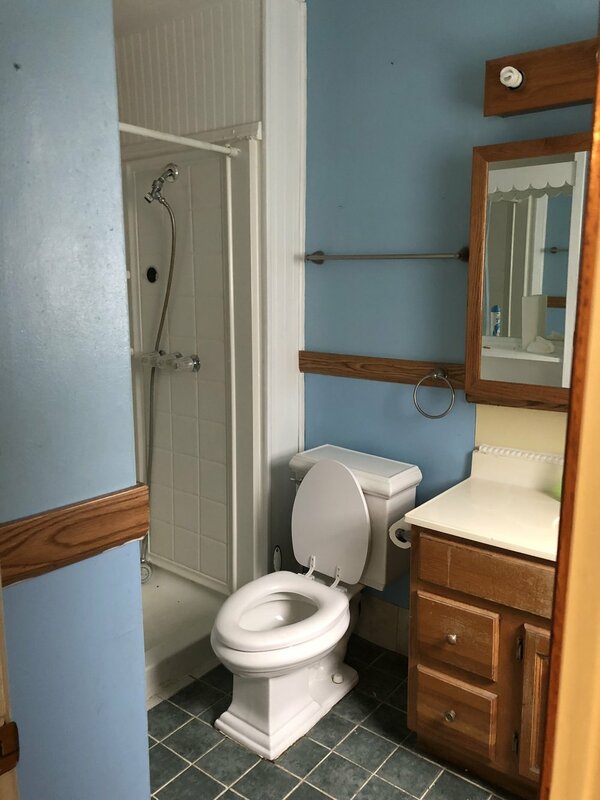 The bathroom is small, but it is still nice! I did take a lot of little video clips of this whole renovation and I have them saved in my story highlights on Instagram. The last space left to show you is the laundry/back entry/mudroom. I really love this area. It was awkwardly laid out at the time because of that doorway that had been closed off and a window-turned-shelf. When we had the plumbing re-done for the whole house, we had the plumber also move the hookups around.